Starting in 2019, students at St. Thomas University in Miami Gardens, Florida, will have new student housing on campus. While Phase I [Donnellon Hall Renovation] is located to the south of campus near the recently renovated Cascia Hall, the proposed new building in Phase II are located to the Northwest. The potential placement of Phase II at this location provides a new ‘residential quad’ area on the opposite end of campus. Doing so creates a new residential area of campus, flanking Carol hall and the Student Center. This location is set within the landscape next to the trees and pond, but is also adjacent to parking and sports facilities. At the beginning of the fall semester 2018, anxious students from Cleary University were able to move into their new home on campus. Phase II of Cleary University Student Housing features hybrid-style student units, complete with kitchenette and bathroom suite. For more information on the Cleary Student Housing Phase II, click here. 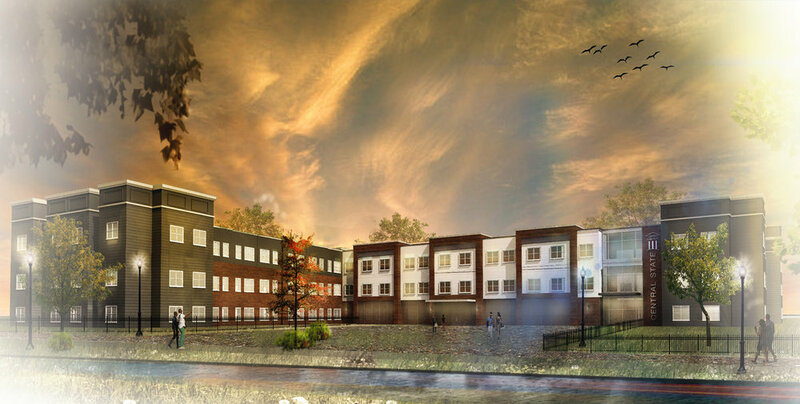 UHS was recently awarded the contract to design and build a 100-bed student housing project in the center of Thomas More College’s campus. The proposed design of the residence hall embodies a contemporary take on existing campus vernacular and creates a social hub for student residents. The form derives from basilica typology - a large, open, centralized nave and gabled roof - which becomes a community space for residents. Materials and massing stem from the newly constructed campus chapel - extensive brick walls, tall expanses of glass, and a standing seam metal roof. With a spacious area situated between the two glass facades, students are provided a common area where they can gather, study, and interact with peers. Using natural daylight requires less energy to light and heat the space, while providing appropriate light levels for learning and studying, transforming the way of students live on campus. Thomas More is expected to be completed by August 2018. After a few revisions of the project scope, the Central State student residence building has commences with earthwork. The building is divided into four different types of programmatic functions: Apartments / Admin / Wellness Center / Secondary Spaces. Both the wellness center and administration occupy the ground floor main wing near the entrance from both campus and the parking. The residence hall requires a 12-month construction schedule, and will open in Fall 2019. In late June of 2017, the first shovel went into the ground for an idea that’s been circulating around Terra State Community College’s offices and boardrooms for years. Terra Village, a bustling residence hall with hundreds of students, is set to become a reality. The groundbreaking ceremony was attended by Terra Community College Officials, MKC Architects, developer University Housing Solutions, and countless donors, students, and faculty. By the fall of 2018, students will be living in the $14.5 million facility, within walking distance of the college’s main buildings. UHS submitted a four-some to compete in the annual charity golf-outing at the Summit Hills County Club. The 2018 Thomas More College Scholarship Golf Classic is an event that raises funds for student scholarships. In the spirit of partnership, UHS continues our relationship with current and past clients, and was happy to participate for the cause of academic pursuits. 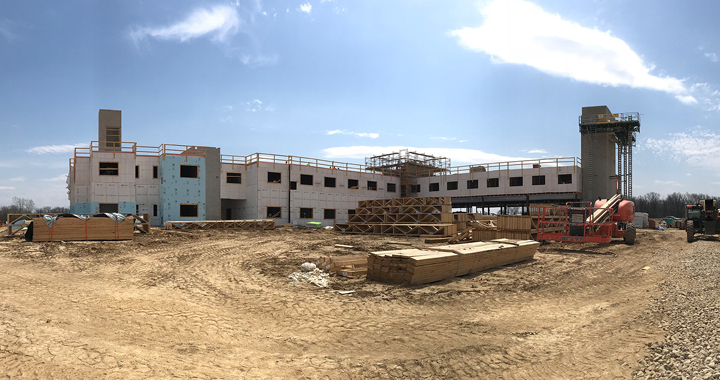 Following the immense success of the Cleary University on-campus apartments, UHS has been constructing an additional second building adjacent to the first. This building will feature over 100 student beds, providing residence for the influx of students at Cleary University looking to live on campus. Low maintenance and durable, this apartment style-housing will feature large open lounges on each floor, private study areas, and an exterior courtyard. The building will open for students in Fall 2018. Thomas More Phase I Housing is progressing at a rapid pace. The exterior envelope of the building is in place, and brick is ready for installation. This new student residence will serve as the first of a series of improvements and additional buildings on the Thomas More College Campus. Phase I also provides a new pedestrian link to the Saints Center and recreational areas. The building will open for students in Fall 2018. The construction for the Landings at Terra Village is continuing into the spring. Two stories of the building have been erected, with interiors framed and external weather barrier applied. Up next, the building will receive windows and siding materials, creating a complete building envelope.